Disabled veterans go tthe chance to test their abilities on the snow with compimentary adaptive ski lessons from Achieve Tahoe, a non-profit that opens doors to outdoor recreation for children and adults with disabilities. With the help of instructors from Achieve Tahoe, disabled veterans got the chance to hit the slopes at Squaw Valley last week as part of the nonprofit’s 10th annual Anthem Winter Ski Festival. 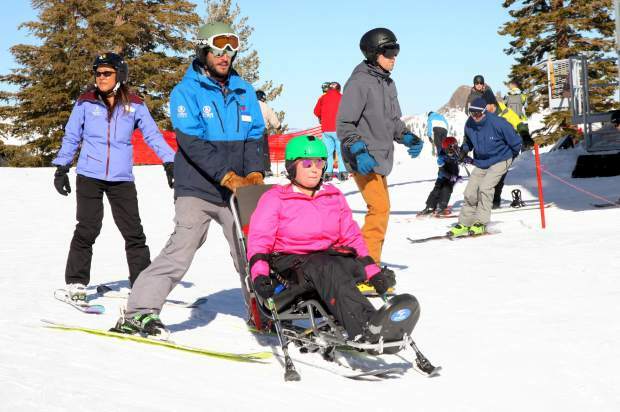 Each year Achieve Tahoe, which helps those with disabilities participate in challenging winter and summer sports, provides veterans injured during their service with complimentary lessons on adaptive ski equipment. With the sponsorship from Anthem Blue Cross, Squaw Valley Alpine Meadows and Warfighter Sports, a program offered by Disabled Sports USA, veterans were also offered overnight stays in the village, meals and transportation. The group of veterans varied in age and disabilities from amputees to those with spinal cord injuries or who are visually impaired. Each participant had a personal instructor either guiding them through shouted commands or holding onto their monoskis while assisting them in making turns down the hill. As someone who has been skiing nearly his whole life, and instructing adaptive snow sports for 12 years, Hunter said he couldn’t imagine his life without the sport. “I love seeing all of our guests find the freedom and independence that skiing gives all of us,” he said. Hunter said without the support of the community the event wouldn’t be possible. Founded in 1967, Achieve Tahoe has been the longest operating adaptive sports program in the country. Throughout the year, the program provides adults and children with physical, sensory and intellectual disabilities the opportunity to participate in outdoor recreation activities that would typically be off limits for those individuals. According to Hunter, the program’s youngest skier last year was 3 years old and the oldest was 98. “What’s exciting for us is building inclusivity for people,” said Camille Cauchois, program manager. She said that many of the families that participate have a family member with autism or a spinal cord injury. Cauchois recalled a student she has skied with for the past five years who has an intellectual disability. Cauchois said that most families may not think it’s possible to ski together if a family member has such a disability. Hannah Jones is a reporter for the Sierra Sun. She can be reached at hjones@sierrasun.com or 530-550-2652.